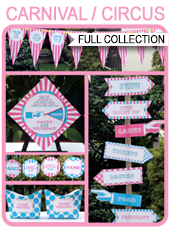 Instantly download this Carnival Party Ticket Invitation template! ALL text on this template is editable! Edit and print as many times as you like. 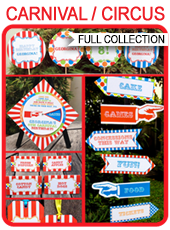 You personalize it with the Name, Age and all your other Circus or Carnival party details at home. Simply open it in Adobe Reader and type over my sample text. Download links to the Carnival Party Ticket Invitation template will be sent directly to your inbox. PDF file with two 3.5 x 8.5 inch invitations per page. Download your Carnival Party Ticket Invitation template immediately after your payment has been processed. 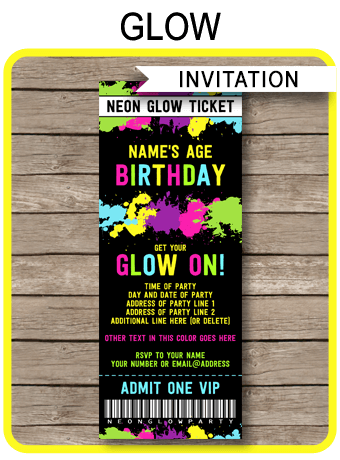 Trim out your Carnival Party Ticket Invitation on the provided cut lines. Great decorations and lots of options! Easy to print yourself. This package is awesome! It has so many cute things and since I can edit them, it makes it so nice, in case I change my mind about cheese puffs instead of cheese curls….lol. So awesome! Thank you. I have one happy kid. Awesome design, super easy to use and look amazing printed! Professional and kind seller who is committed to customer service. Cute and clever tags make the perfect note to add to my son’s birthday party favors!